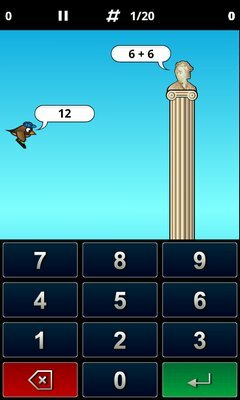 Help your bird avoid crashing into columns by solving the arithmetic questions. Win coins with the right results and upgrade your bird, select hats or shoes to make your bird really into your own, special one! Collect more stuff as you play along. 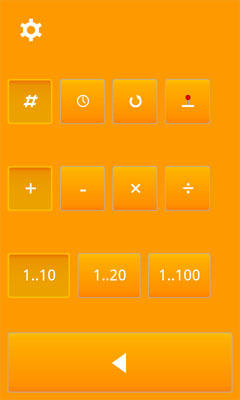 Train mental arithmetics in a fun way and experience stunning improvements. This is a perfect way to show your knowledge of times tables and stuff... and perfect to improve your mental arithmetic skills wherever and whenever you want! Free card model! Get it now! Colorful retro-twist on a match-3 type arcade game. No violence but full of fun! Birdies are a strange and happy folk and loooove to party... but only with the same color. And only at least three of them. 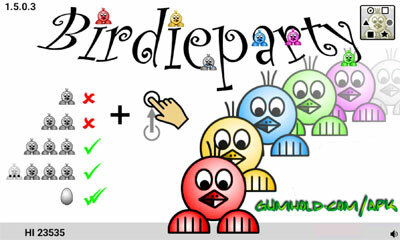 Help them finding their party and touch gangs of at least three Birdies of the same type to make them happy. Without your help, eventually they will hit the ceiling - and your game ends. Touching a single Birdie or one of just a pair makes her or his head ache so terribly. Also they loose their color so they really don't want to party anymore. Don't do it! Touching an egg helps all Birdies of the same color to the Megaparty event. So do this! No violence included, so even nice for playing together with your child (or your mom!) 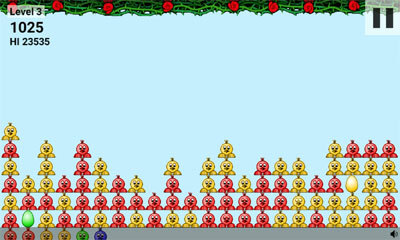 - but a lot of fun also just playing alone and trying to improve the Highscore. 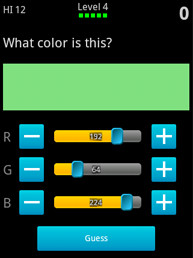 The task is simple: Just guess the right RGB values for given colors. As a start, there are just two possibilities for each color channel 0 or 255 - resulting in only 8 colors you have to know. Easy, isn't it? 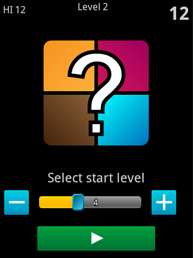 After a while the difficulty rises and if you master level 4 (729 different colors) and reach level 5 with its 4913 colors you're quite good and probably professionally trained. A painter, designer, ... ? But still, this is so far away from the 16777216 colors in level 9 - where we don't expect anyone to get anytime soon. 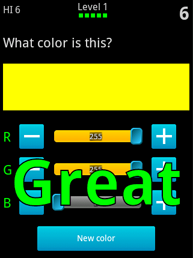 Besides, the most mobile displays can't show these many colors anyway. NEW: Hexadecimal mode to make our fellow web designers happy! Remember the old days when computers had 8-bit processors and 64kB only? Remember the Sharp MZ-700 with it's ASCII graphics, Z80 processor, just 8 (Eight!!!) colors and not much sound? It came with some prepacked games, one of them was Man-Hunt which I really liked... and still do. So I took the chance to see how complicated it is today to implement such a game. 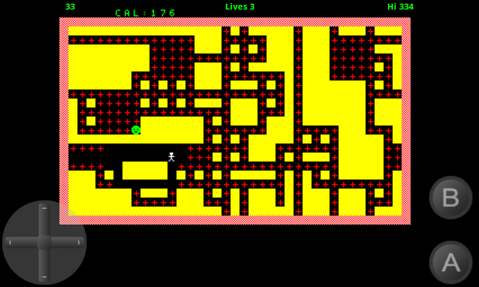 Yes, writing a primitive screen driver was nice and a bit of work, but the game itself was not much trouble. So if you like this game and I see it is downloaded, chances are great that some other Sharp MZ-700 works of art will follow. Why? 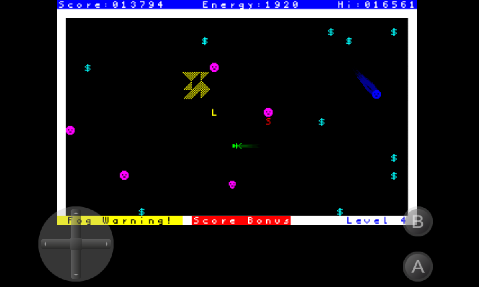 Just found no emulator for Android running smooth and being in a RETRO-mood myself... It's been 30 years I coded on this machine in the first place, so the sentimental journey was very welcome. NEW: Support for external keyboards allow the games to be played as they were meant in the good old days. MAN-HUNT Are you able to clear the maze completely? Even when there are more ghost coming? 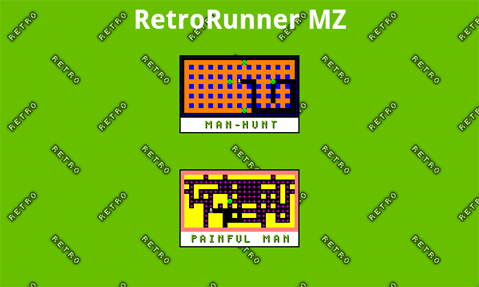 PAINFUL MAN is very similar to the old game: Collect all energy to get to the next labyrinth without crashing into enemies and before your energy runs out. LAND ESCAPE comes with some changes to the original game I always wanted 30 years ago. E.g. a nicer fuel and heat display ... 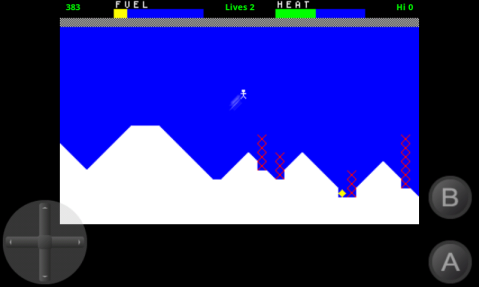 Try to run and jetpack over and around the obstacles and get as far as you can. 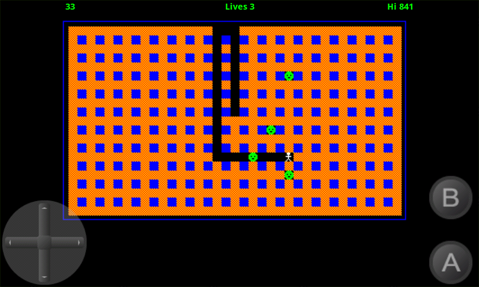 MOVING SEARCHER makes you collect all fuel cells to clear the level. 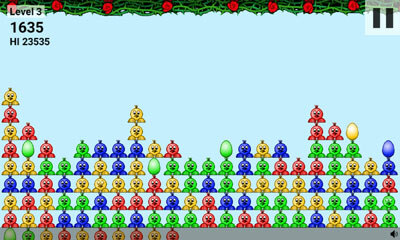 Easy in the first levels, harder in higher levels. Oh, I couldn't resist to add a new element not in the original game: Get to level 4 and up to avoid the fog of pain. 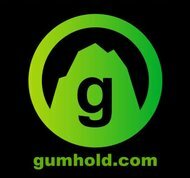 This free app contains banner ads - but only loads them when the device is connected via WiFi to save costs. This is an experiment and probably a paid version will follow. Without ads then, if there is any interest in such.